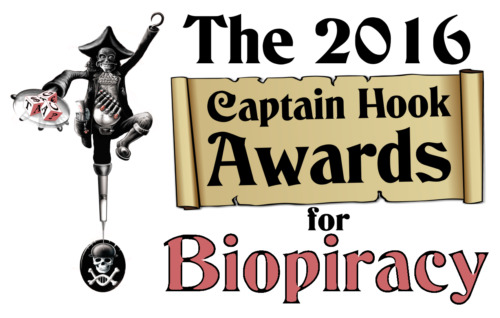 The 2016 Captain Hook Awards for Biopiracy – submit your nominations now! The Coalition Against Biopiracy (CAB) will host the 6th Captain Hook Awards ceremony at the Thirteenth Conference of the Parties (COP13) to the Convention on Biological Diversity (CBD) in Cancun, Mexico, 4-17 December 2016. Nominate your least-favourite pirate for a 2016 Captain Hook Award, and your most admired biopiracy resistors for a 2016 Cog Award now! This award ceremony comes as high-tech ‘digital’ biopiracy is becoming easier than ever. With the accelerating tools of genome-editing and synthetic biology, today’s biopirates no longer need to carry their booty offshore in boats and airplanes – they can swiftly upload DNA as digital sequences in one location and then recreate it as synthetic DNA on the other side of the planet. As the CBD meets to discuss what to do about Synthetic Biology it’s high time to take on the new cyberthieves of the biodiversity commons. Synthetic biology pioneer Craig Venter has won the lifetime achievement award. COMPITCH and other indigenous peoples’ organizations in Mexico won in 2002 for defeating the US government’s $2.5 million bioprospecting project in Chiapas. See here for full lists of previous winners. Biopiracy refers to the monopolization of genetic resources such as seeds and genes taken from the peoples or farming communities that have nurtured those resources. It also refers to the theft of traditional knowledge from those cultures. Today the main source of biopiracy occurs by corporations, academic institutes and governments claiming intellectual property over genetic resources – patents on life (eg gene patents) or claiming plant breeders rights. The introduction of new biotechnologies such as genetic engineering has facilitated a new wave of biopiracy. With the advent of nanotechnology ownership of nature has now reached a more fundamental level. As well as gene sequences, nanopirates are claiming ownership of the molecules and even the elements that everything is made from. Meanwhile the culture industry has been commercially exploiting the art, culture, language and symbols of indigenous cultures – often claiming trademarks on knowledge which they have stolen.